After finding fresh rosemary at the supermarket yesterday I immediately thought of roasted potatoes. So I bought two zucchini, an eggplant and tomatoes and had the following for dinner last night. Again, a well received classic. But there's not much you can do wrong with this anyway. Gorgeous! Send me the leftovers! Fresh rosemary roasted potatoes, I want some! 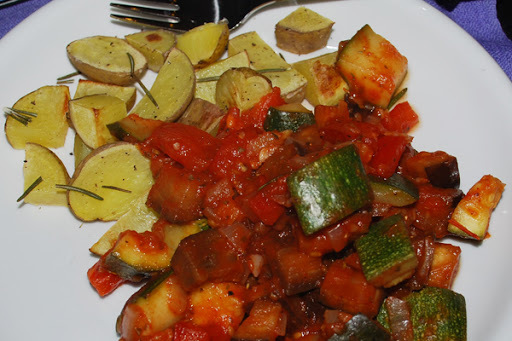 Definitely can't go wrong with a classic ratatouille dish - looks wonderful, girl! Yay-- you are no longer a pecan virgin! I guess they DO kinda taste like walnuts... unless you roast them. Try roasting them-- they taste amazing and make the kitchen smell so good! YAY! Ratatouille!!! Gorgeous!! =) And rosemary potatoes, I can just smell them. Have you seen the Disney movie, Ratatouille? It's so adorable! Everything looks gorgeous as usual. If I ever want to buy a camera and stop using my boyfriend's, I'll ask you! 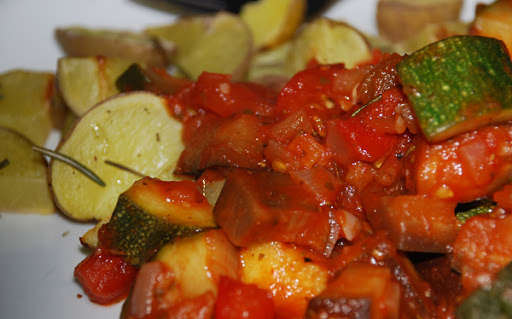 Can you believe I've never had Ratatouille? I really want to try it now though - yours looks so good! Mexican Pizza makes my night!